This is where we (Jack and Co) will let you know what projects we have going on in the store. These may be something a customer or student brought in or just something we have come across. Sometimes a project will be here for quite a while and sometimes perhaps only a few weeks. After all, Jack is here because of the passions we share. Restoration of something created decades earlier is one of our passions. Whether it's stained glass, a quilt or a piece of furniture, you will probably always find a project or two in various stages of rebirth at Jack's. We love to make the old new again just as much as we love creating from scratch. Currently, we seem to have our quilting noses buried in re-creating antique quilts. Some re-creations are from photos and some are from actual vintage quilts that are so old, tattered and well loved that they deserve to live again for another 50 to 75 years. We are supporting the endeavors of Heather Spence. She is an Etsy artist who creates and hosts Mystery Quilts to benefit specific individuals who are battling health issues. Her current mystery quilt is entitled "Jack of Hearts" (gotta love that one) and the recipient of the proceeds is a five year old boy fighting cancer. Heather collects $15 from participants and those proceeds go to Jack. Personally, I think it's a glorious thing to do. Find more info at: www.heatherspencedesigns.com/mystery-quilt/. If that address doesn't show up as a link for you, just copy and paste into your browser. The first clue was delivered October 5th. If you decide to participate, I would love to have a display of these quilts that benefit little Jack when the program wraps up. I will work on mine at the store -- now to select my fabric! This one I call "antique star". It came to me quite by accident. A customer brought a very broken stained glass lamp shade into our store in Tempe, years ago, to have repaired. She had wrapped it in a beautiful old, ragged quilt. The lamp shade was beyond repair but I asked her if she would be intererested in selling me the quilt. After having created quilts, I know they deserve a special place -- regardless of their condition. This particular quilt had been left in her trunk for years and she just used it to pad things. I was heartbroken. She didn't have any real history on the quilt; she just said it came from 'one of the grandma's houses'. Anyway - she just gave it to me if I would dispose of the lamp. I washed the quilt (I know; but it was truly filthy) and gazed at it for many years. It was so soft and still had lots of lovely parts. The original maker was a very fine quilter. I'm guessing it was made in the 30s/40s. It's all hand pieced with tiny, tiny, even stitches. 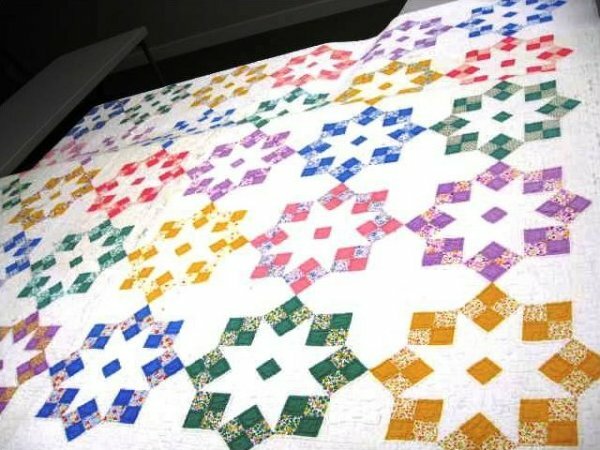 This quilt represents MONTHS of a woman's life. Countless hours spent gathering just the right fabrics, cutting, piecing and finally quilting this beauty. I had never seen the pattern anywhere else. So I got out my rulers and compass and I think I finally have good templates. I'm not a pattern maker nor a math whiz so it looks like a hand piecing job for me, too. But I have cut all the pieces out and it's ready to assemble. It's full of points and angles and it will probably be years of my life but I will finish it. So the next time you're in the store, ask to see it -- its new little sister will probably be on the design wall from time to time as well. You'll be able to feel the love that still lives in those old stars. Oh - and if any of you know the name or the pattern, I would love to have that information.